The most common question I get asked at the field is: "how much does paramotoring cost?" This is a really important question to ask if you're thinking about taking up the sport. When you know what you can expect to pay for your equipment, training, and running costs, you can decide on the best route to becoming a pilot. So how much does paramotoring cost? Buying new, you should be able to buy all of the necessary equipment, and get yourself trained for about £9000, or $14000 for US pilots. This post will include a more detailed breakdown of the costs you can expect to encounter as you enter the sport, from paying for training, to buying insurance. We'll also look at exactly how much paramotoring is costing me per year, how much it costs me to fly per hour, and I'll give you some helpful buying tips along the way. All of the paramotoring costs in this article will be very similar in all other countries. You can click HERE to use the Google converter to covert to your currency. The first thing you will need to buy is training. Training costs will obviously vary, as there are many different training courses available. Remember, in most countries no license is required to fly a paramotor, or to open a paramotoring school. This means that anybody on the planet can legally open a school, and offer you training. For this reason, it's important to do some research before committing to any school or instructor. Post to forums, social media, and search for some of their previous students to find out about their experience with them. Your safety is in the instructors hands, so choose the best school you can find. In the UK you will be looking at around £1000 for a full paramotor training course. US readers should be able to find training for around the same price, which converts to about $1400. Some schools offer you a certain number of days for your money, for example 7 days for £900. If you don't feel confident in your abilities after you've used up all of your days, you will have to pay again. Others will offer a fixed cost for as many days as it takes to get you soloing. 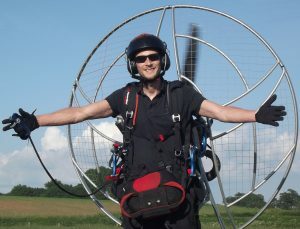 I encourage everybody to delay purchasing their paramotor and wing, until after they've completed training. If you're wondering why, you can read about all of the mistakes newbies make HERE. The cost of a new paramotor will be around £5000, this varies by £1000 either way depending on the manufacturer. Before making your decision, talk to your instructor, and do plenty of research. There are some cheap imitations of well known brands, and also some really awful engines available, so choose wisely. Buying a secondhand paramotor can cut the costs, but you need to be really careful. I bought my first motor secondhand and it was a pile of rubbish! Read more about that in the linked post above, or check out my budget paramotoring post HERE. My second paramotor was also secondhand, and it was great, I knew what to look out for by the second time. If you're unsure then it's best to find somebody that has plenty of paramotoring experience, and take them with you to inspect the motor. A good secondhand motor will cost you from £2500 and up. Find out exactly how to choose the right paramotor for yourself and avoid lots of buying mistakes > HERE. 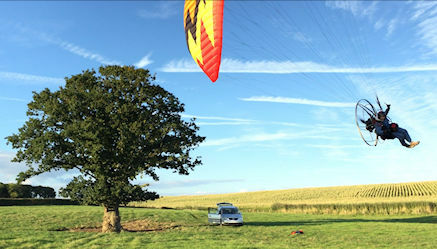 A new beginner paramotor wing will cost you about £2500. Your instructor will advise you on the best beginner wings, and where to buy them. Be very careful as most instructors are also dealers, and I know some instructors are offering their students terrible wings just to get a sale. If you plan on buying a secondhand wing, you must once again be very careful. The lifespan of a wing will be about 400 hours of flight time, but this can vary either way depending on UV and moisture exposure, and mechanical stress. You should make sure the wing has been sent off and inspected. This inspection will include a full porosity test, a line check, and a full visual inspection. If it has been inspected, the seller should be able to provide you with a full report, and the test results. Never buy a wing that hasn't been tested, as you'll never know what you're buying. The wing could be porous, the lines may be damaged, etc. If you buy a wing without a report you could be buying a death trap! Secondhand costs for a wing in good condition will range from £1000 - £1700. You should buy yourself a good helmet to protect you from trips or bad landings. Helmets will cost from £80 - £450, or you could pay a little extra for a helmet / radio headset combo. If you plan on flying very high or during colder weather, you will need a flight suit. You can expect to pay £100 - £200 for a decent all in one suit. Something else that you may wish to get is an altimeter. Something like the Fairhaven Micro Alti is great as they also display other things like a G-force, your flight time, a variometer, etc. These cost £120, but other variometers are available. A windsock and pole are essential gear to leave in the launch field. The wind can change in seconds, and you will find it hard to tell the wind direction in flight. This will cost you about £20, or some wing manufacturers give you a free windsock when you buy a wing. There are a few other bits you'll need, so see my full guide on all of the equipment you'll need to get before you can fly > HERE. You may also need to think about how you're going to transport all of your equipment to the field. If you don't like the thought of putting your paramotor inside your car, you may need to get a carry rack. These will eliminate the problem of fuel spills or oily marks on your upholstery. Many pilots build their own racks, or you can buy one like the one I use HERE. That just about covers the equipment side of things, and you can see that paramotoring is not cheap, but it is within reach of most people. So what will paramotoring cost you altogether? You're looking at a total of about £9000 for training plus brand new gear. Not bad for the freedom of flight ay? The good thing about this, is that once you have the gear, it will last you for many years. The only other costs will be running costs, and basic maintenance of a two stroke engine. What other forms of powered aviation will get you off the ground for under £10,000? I don't know of any. If you buy a paramotor with a two stroke engine, you will have to buy two stroke oil to mix with your fuel. Most engines will run a mixture of around 40:1 meaning that if you fill a five litre fuel can with petrol, you'll have to add 125 ml of oil. A decent two stroke oil (Find the best paramotor oils HERE) like Castrol power one racing, costs about £10.99 per litre. So at 40:1 you'd have enough oil to mix 40 litres of fuel. This would give you 10 hours of flight time with my Vittorazi Moster 185 engine, others will be very similar. So who likes maths? Here goes.. The price of unleaded petrol is currently averaging £1.19 per litre so you'd pay £5.95 to fill a 5 litre can. Add oil at 40:1 and it will cost £7.32 total, divide this by 5 to get £1.46 per litre. My engine will drink 4 litres per hour so it costs £5.85 to fly for one hour. I fly a lot more than most people I know, in the UK flying 45 hours per year is considered a lot. Your annual paramotoring cost will really depend on how much you fly, but I will go by my own statistics. Last year I managed 90 hours so we'll take our hourly figure of £5.85 and times it by 90. This gives us a figure of £526.50 yearly paramotoring cost! That is really damn good for a whole year of flying! I usually pop a new spark plug in my motor every 25 hours. They will last longer but they are so cheap I like to renew them earlier than necessary to be safe. A spark plug will cost about £2.25 so that's only £6.75 per year. It's not required by law, but I also buy insurance with AXA which will cost you about £130 per year. Although insurance isn't required by law, I definitely recommend you get it. All it takes is an engine out, and you could easily land onto somebody's property causing damage. The insurance will pay for any accidental damage caused while you're strapped into your paramotor. You should bare in mind that every now and again the engine may require new parts. Reduction belts usually last 100 hours before they need replacing. Eventually engines will need rebuilding, and clutches will need replacing, but these are things that last longer than a year. It's worth bearing this in mind, but you don't need to consider this as a running cost. The good thing about small two stroke engines is that they're easy to work on, so you can fit any replacement parts yourself. This avoids the cost of paying somebody else to do it. Engine rebuilds are also fairly straightforward, as are clutch and pull starter replacements. Check out my maintenance post HERE. It's recommended that you have your wing inspected once per year, or every 100 hours, whichever comes first. This ensures the wing is still safe to fly, and poses no risk to anybody flying it. I know many pilots that don't bother sending their wings off, but it's not worth the risk. With a full inspection your wing will be tested for Porosity, line strength, Line length and symmetry. It'll do lots for your confidence in your wing, and is well worth the money. A yearly inspection of your reserve parachute is essential to ensure the materials haven't become compressed. They can also hold trapped moisture and grit which can damage the fabric. A fresh repack also ensures the fastest opening time in the event of a deployment. A wing inspection and service costs me £95, and a reserve repack is £50. Most inspectors include a certain amount of repairs in the price, but you may have to pay extra if there's lots to fix. If there isn't anywhere to take your wing and reserve locally, you may have to send it in the post. Places like the loft will arrange their own courier, but you'll have to pay extra on top to cover the cost of the postage. So that rounds up the annual paramotoring cost for a pilot flying 90 hours per year. I mentioned that 45 annual hours is considered a lot in the UK because of the limiting weather conditions. This is half of what I fly, so you would slash these fuel prices in half! Now you know every paramotoring cost to be aware of, you can see this sport is very affordable. 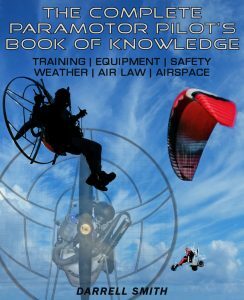 Bare in mind that there may be one extra paramotoring cost to consider if you fall and break a propeller. This is rare but it does happen to everyone eventually, propellers cost about £300 each. Discover lots of ways to transport your equipment to the field > HERE. Find out exactly what paramotoring is like from a long time pilots point of view, so you can decide if it's really for you > HERE. If you don't know the right ways to enter the sport, you can find out how to begin paramotoring > HERE. Find out how a paramotor and wing works, and what makes them fly > HERE.